Here is the finish line at the Great Hawaiian Rubber Duckie Race in support of Cerebral Palsy. Since 20,000 ducks are in the water the only way to determine which ducks cross first is not to have an actual finish line but a finish lane. In the center of the picture you can see one of the “judges” sitting on the boat watching for ducks to pass through the hole just big enough for one duck. So getting to the finish line is not good enough you have to make it through the lane to victory. Alas my duck did not win but to the lucky victors went Waikiki Mariott Resort and Spa Vacation, trips to Vegas, Dolphin Encounters and much more. The top 50 ducks won a prize and so did the wayward duck that finished in absolute last place. To all of us non winners… there’s always next year. The big winner is the United Cerebral Palsy Association of Hawaii for putting on a great fundraiser. See how the race started here. 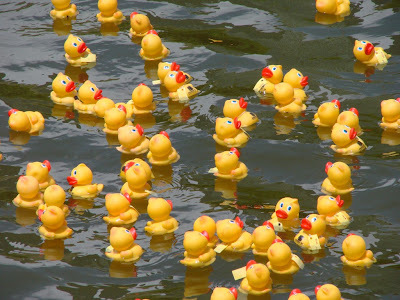 Here is a close-up of just some of the 20,000 ducks racing down the Ala Wai canal. As you can see each duck has a tag attached to them with the corresponding number of the participant. In order to ensure fairness in the race all ducks are pre-tagged and randomly dumped into giant bin. 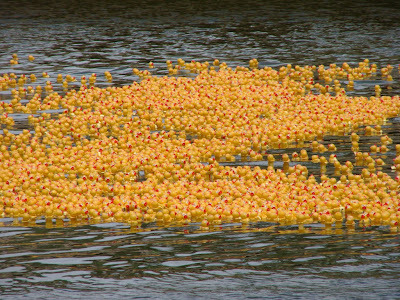 This prevents people from buying a duck and tossing it into the water during the race and also makes sure the ducks can be reused for next years race. 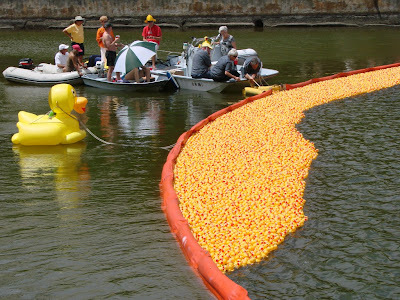 Here is what 20,000 ducks racing down the Ala Wai Canal looks like. Most definitely a sight to see. This race is to raise money to fight Cerebral Palsy. This is a group of chronic conditions affecting body movement and muscle coordination. It is caused by damage to one more more specific areas of the brain during fetal development or shortly following birth. The race is raising funds for training and therapy to improve the lives of those with Cerebral Palsy. Tomorrow a closer look at the ducks. Also see the start of the race here.